The rubber fingertips scrape hard to reach crevices at the bottom of boots and shoes. This simultaneously cleans your footwear and traps debris, keeping your home or business spick and span. 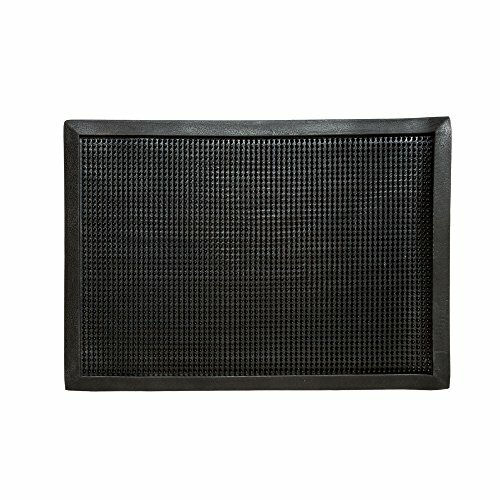 Simply place these scraper mats at all outdoor entrances for a cleaner home. These durable, heavy duty rubber entrance mats are built to withstand heavy foot traffic and last you and your family for years. We're so confident, we offer free lifetime replacements. The fingertip entrance mats firmly grip your floor to prevent slippage and feature ramped edges to keep dirt and debris in. KEEPS YOUR ENTRANCES CLEAN - Rubber fingertips thoroughly scrape the crevices of boots and shoes, trapping dirt and debris while cleaning your footwear. HEAVY DUTY CONSTRUCTION - Scraper mat built with durable, high quality rubber designed to withstand and protect high traffic areas. FIRMLY GRIPS FLOOR to prevent slippage. The outdoor entrance mat's ramped edges keep dirt and debris in, while preventing a tripping hazard. PERFECT FOR PROTECTING your home or business from outside dirt and debris, keeping it clean. LIFETIME REPLACEMENT WARRANTY - Iron Forge Tools stands behind all of its rubber entrance mats 100%. If anything ever goes wrong with this, we will replace it with a new fingertip entrance mat. If you have any questions about this product by Iron Forge Tools, contact us by completing and submitting the form below. If you are looking for a specif part number, please include it with your message.